A majority of cancer tumors contain regions of low oxygen concentration where cancer treatments based on the action of reactive oxygen species are unproductive. Recently, American researchers have created a hybrid nanomaterial that discharges a free-radical-generating prodrug within tumor cells upon thermal activation. They report in the journal Angewandte Chemie that the free radicals terminate the cell components even in oxygen-depleted conditions, causing apoptosis. Delivery, discharge, and action of the hybrid material can be precisely manipulated. A number of prominent cancer treatment schemes are based on the production of reactive oxygen species (ROS), which trigger apoptosis for the tumor cells. However, this system functions only in the presence of oxygen, and hypoxic (oxygen-depleted) regions in the tumor tissue regularly survive the ROS-based treatment. Therefore, Younan Xia at the Georgia Institute of Technology and Emory University, Atlanta, USA, and his team have formulated a strategy to transport and discharge a radical-generating prodrug that, upon activation, destroys cells by a ROS-type radical mechanism, but without the prerequisite of oxygen. The research authors explained that they had to look at polymerization chemistry to locate a compound that creates sufficient radicals. There, the azo compound AIPH is a recognized polymerization initiator. 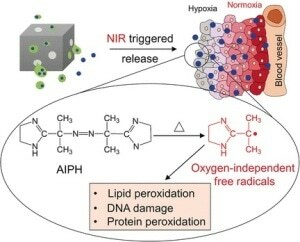 In therapeutic applications, it creates free alkyl radicals that cause DNA destruction and lipid and protein peroxidation in cells even under hypoxic conditions. However, the AIPH must be securely delivered to the cells in the tissue. Thus, the researchers used nanocages, the cavities of which were packed with lauric acid, a so-called phase-change material (PCM) that can act as a carrier for AIPH. Once within the target tissue, irradiation by a near-infrared laser heats up the nanocages, causing the PCM to melt and activating the discharge and decomposition of AIPH. This concept functioned well, as the team has displayed with a number of experiments on different cell types and components. Red blood cells experienced pronounced hemolysis. Lung cancer cells integrated the nanoparticles and were severely damaged by the activated release of the radical starter. Following the treatment, actin filaments retracted and condensed. And the lung cancer cells exhibited major inhibition of their growth rate, autonomously of the oxygen concentration. Although the authors acknowledge that "the efficacy still needs to be improved by optimizing the components and conditions involved," they have showed the effectiveness of their hybrid system in destroying cells, also in places where the oxygen level is minimal. This strategy might be very applicable in cancer theranostics, nanomedicine, and in all applications where targeted delivery and controlled discharge with excellent spatial/temporal resolutions is wanted.